― Aletheia Luna, Old Souls: The Sages and Mystics of Our World. Empaths are the most sensitive ones among all. The term ‘empath’ is derived from the Greek words ‘em’ meaning in and ‘pathos’ meaning ‘feeling.’ Hence, a person who can feel the feelings of others is called an empath. An empath is characterized by the traits of understanding the universe around them. Though many of us might claim to have the sense of empathy, very few are rather what we call authentic empaths. 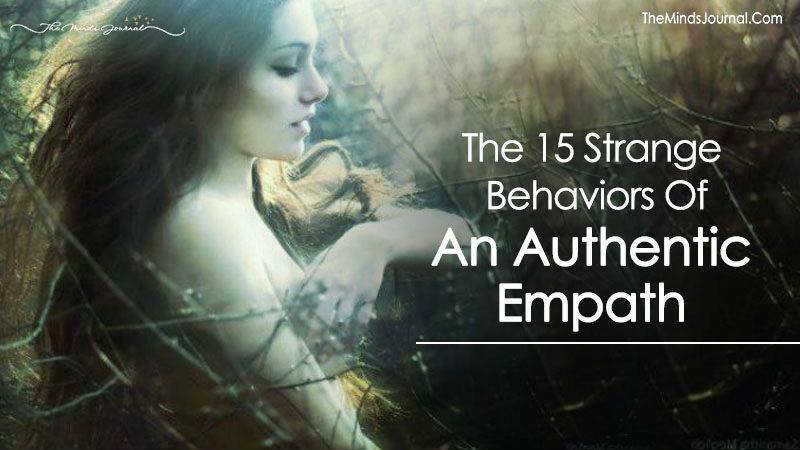 It is but hard to notice when an empath is around, below we have listed 15 strange traits and behaviors that are common among empaths. One of the predominant traits of an empath is sensitivity. They can’t see anyone in pain. They feel a person’s suffering as if it’s your own. In this situation, they will try their best to lessen the pain. They can sense positive and negative vibes in people. While talking to people, they will figure out their negative intentions even if they don’t spell it all. The empath can easily track their thought processes without giving them a single inkling about it. Since they are constantly getting affected by the energies of people around them, an empath gets drained easily. They are always busy helping out people. Hence, their energy decreases. Also, negative energies pull an empath down. This is however not good for their psychological and physical well-being. An empath gives too much to the world more than what they receive. At the end of the day, they feel completely exhausted. Not just psychologically, but physiologically too, an empath can feel the pain of others. They tend to catch pains like cold or body aches of the person. An empath absorbs emotions of other people, be it pain, anger or fear. They feel exactly what others are feeling at that moment of time. If they feel someone needs help, the empath will immediately jump into it. They might know that person, they might not. The empath always tries to help people irrespective of the relationship they share. An empath is drawn towards not just human beings but animals and plants too. They feel upset when a tree is cut or a pet is mistreated by the owner. The empath takes steps to stop the living being from getting hurt. If they can’t do anything to help them, the empath will leave the scene because they can’t stand and tolerate their pain. An empath cannot stand violence even if it’s shown in a television series or a movie. They will close their eyes or leave. If it’s narrated in a book, they will cry. It’s not that easy to fool an empath. They can easily catch a person lying. Even if they don’t express it in front of others, the empath will not trust that person themselves. People who are sad are drawn towards an empath. It’s the empath’s caring and sympathetic nature which alleviates other’s pain. Not just friends but strangers too find it easy to open up to them. Crowds affect an empath a lot. There are so many energies among the people of the crowd that the empath gets confused. All these energies attack them from different directions leaving them baffled. The empath needs space for themselves to introspect on life. They enjoy spending their time alone. It also helps the empath to heal themselves and rejuvenate. An empath gets affected by the energy of the place where they are living. Primarily they enjoy less crowded place surrounded by nature. The empath can sense the energy of the collective consciousness. For example, they can feel the fatigue of Thursday even if they are not working themselves. The empath can feel the joy of Christmas celebrations even if they are having a difficult time of their own. The empath spends too much time helping others. They don’t pay heed to their own needs. The empath must realize that if they don’t take care of themselves, nobody else will.